Structural damage can cause major issues in a residence. Some of the obvious indications can be found in the interior of the home or beneath, in the crawlspace. Below are signs to look for. If you think you have any structural damage issues listed below, then please contact us for a free estimate. Unstable ground. This is the most common attribute which can arise from the original compaction or excessive water getting underneath the footer of the house. If the water gets under the footer it will eventually lead to a cracked foundation or supporting piers to sink. This will be noticed by your floor sloping downward towards the sunken pier. Improper framing. 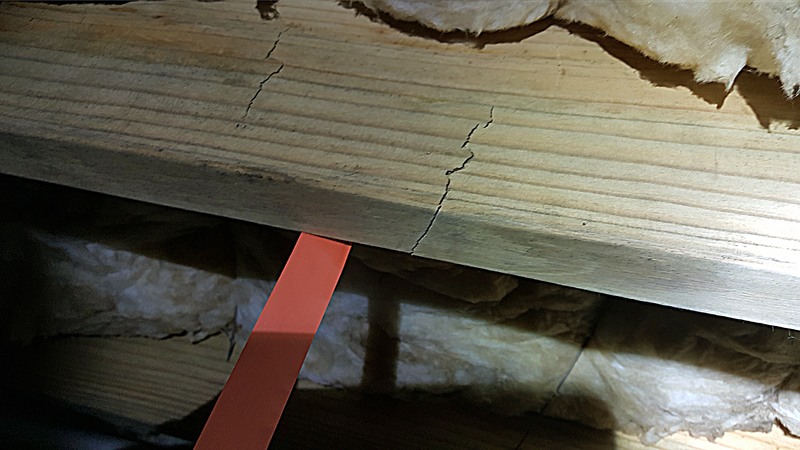 If the builder used improper support beams it will also cause a sloped floor and eventually cracked joists. Using under sized beams is a more frequent occurrence than buyers realize. Moisture damage. This is often over looked as a minor issue, but it is a serious problem that can cause major issues down the road. When the moisture level above 19% in the wood, dry rot and mold will occur. Water damage. Leaks are the main cause for water damage, whether it’s from the roof, siding, or plumbing. If any of these problems are not taken care of in a timely manner or repaired properly they can become a very costly repair. Dry rot. Moisture or mold can cause dry rot, which inevitably breaks down the fibers causing the wood to be brittle. This needs to be addressed immediately as the weight of your home is sitting on these beams and joists. Termite damage. Termites do not discriminate on what piece of wood they are going to infiltrate. If they decide to bury through a structural component then these bearings will need to be replaced once the termite issue is resolved.